Deep Machine are yet another classic band who have regrouped to put together a comeback album late in their career. 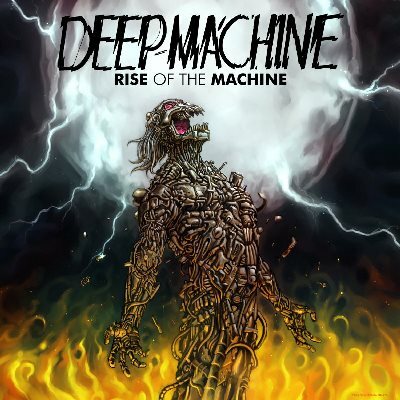 Originally released in 2014, Rise of the Deep Machine marked their first full-length effort and was reissued this year after apparently selling somewhat well. Like a lot of bands from the NWOBHM, they didn’t release much in their early years, but what they did release was pretty fantastic stuff. The main thing you take away from listening to those old and raw garage demos is that they really could have done well to have them recorded in a proper studio. Sure, some of us like those low-fi recordings because they tend to have a charm all their own, but in all seriousness, those early demos really push the limits in terms of recording quality. The ultimate question with this release comes down to whether or not they could take advantage of the benefits of a better recording whilst still capturing the magic of those early demos. And the answer to that question is, well, mostly yes. Their style hasn’t changed much. They favour a lower tempo of heavy metal, and a simpler approach to composition, so that the riffs end up deriving more of their power from musical punctuation than from the composition itself. The riffs themselves aren’t anything spectacular, but when juxtaposed with the vocal hooks and the rest of the rhythm section, they tend to come alive and draw you in. Throw in the lead player’s speedy soloing, and you have the making for a pretty solid release. The first half of the album is definitely the more sluggish portion of the album. And I don’t mean that in terms of the tempo, but rather that it just kind of slowly chugs along, track-after-track with very little that’s exceptionally interesting. It isn’t really until the fantastic “Black Priestess” comes on that everything starts to get moving. After that, pretty much every song is decent, with a good chunk of the songs having plenty of punctuated rhythms and those screamed choruses that I can’t seem to get enough of. The album culminates with the forceful and infectious “Whispers in the Black”, which is in my opinion the best track on the whole thing, followed by “Iron Cross” which comes in only slightly below it. In the end, there really isn’t any serious complaint that I have about this album. The band set out to put together a full release of quality recorded material and they did exactly that. But somehow, I’m pretty sure I’ll be spinning those old crusty demos for years and years to come, and I likely won’t be doing that with this release. I might go back every now and then and hit those highlight tracks, but not much more. Recording quality is important, but it’s no substitute for the beauty of a well-composed heavy metal song. This entry was posted in Heavy Metal, Reviews and tagged Comeback, deep machine, Heavy Metal, NWOBHM, Re-issue, rise of the deep machine, UK.